Our new Yamaha generator is quiet and efficient. It runs for twelve hours on one tank of gas at a low load --- a few fans, a light or two, and a laptop charger. 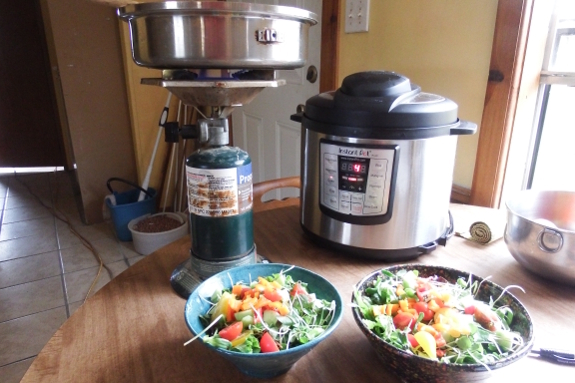 The Instant Pot and circular saw work on the generator too, but both run at a slower speed. After the first test, Anna opted to continue cooking on the propane camp stove instead. I kept using my saw. You might want to have that generator checked,I would think it should run those things fine.It may need adjusted. A circular saw is not a purely resistive load. Such saws generally use so-called universal motors, which is basically a commutated series-wound motor. When running, these motors generate counter-EMF. The voltage and current are not in phase anymore and hence their power factor is reduced. Under such a load, the inverter-generator cannot deliver its full capacity. Check the manual. For the instant-pot, the main power use is probably the heating element. When running at full blast, this is a purely resistive load. However, it is probably electronically controlled with I suspect pulse width modulation. That will probably also reduce the useful output of the generator.